The folks I work with at the Liverpool Public Library already are talking about National Bike to Work Day. It’s next month. Friday, May 19, to be precise. Because our library has a pretty nice bike rack out front in the warm months and has acquired a new Book Bike Cart to better serve the community that will start pedaling around the community this spring, librarians and staffers are talking about how we will hook into the day. My colleague and friend Martina asked me if I would be riding my bike to work that day. I replied that I hadn’t ridden a bike since junior high. So that would be a no, Martina rightly concluded. 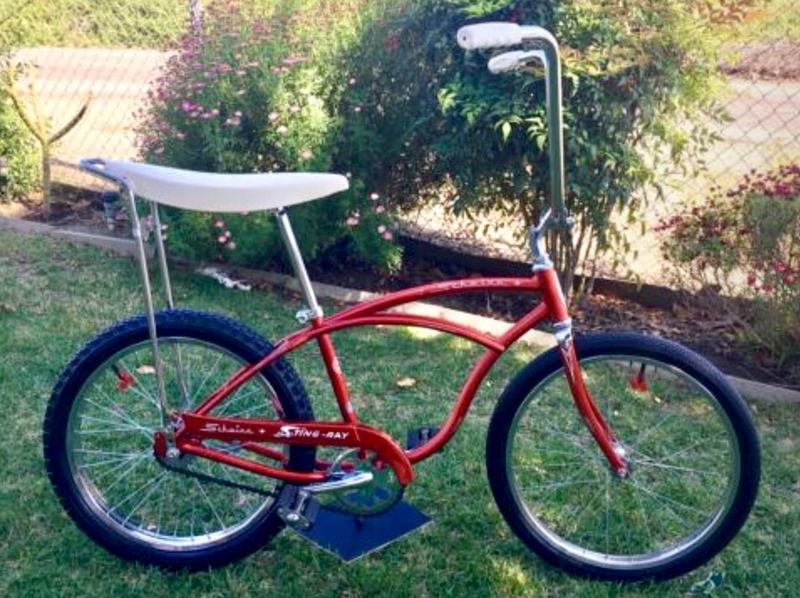 That got me thinking about how I used to enjoy riding my bicycle back in the day. And, OK, perhaps I did continue to ride into my high school years out in Suffolk County on Long Island. My good friends were quite spread out in the Three Village School District, after all, and we didn’t all have cars or driver’s licenses as sophomores or juniors. I ruminated about the bikes of my life. I told my Communications Department colleagues Diane and Edina about my Stingray. My boss Diane know of which I spoke. Edina, being somewhat younger, had to have the banana seat and motorcycle handlebars explained to her. 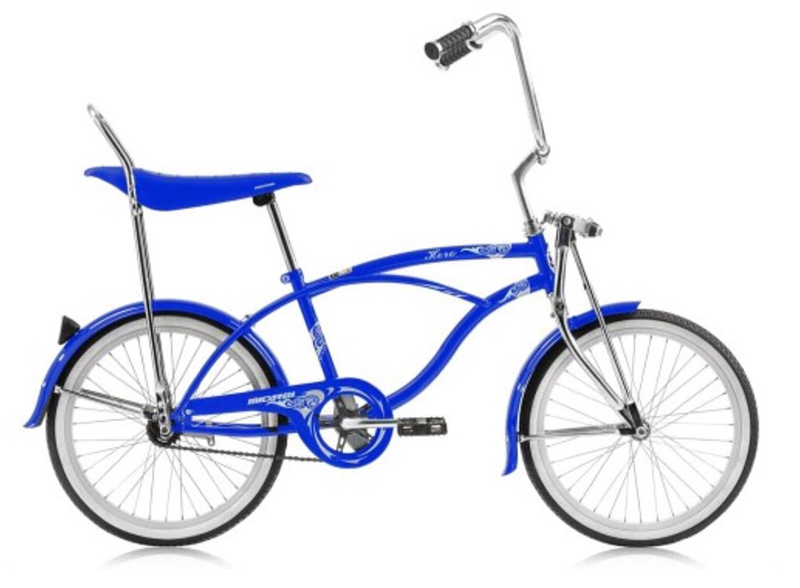 I saw the blue model above – the same color I had in junior high, by the way – on sale now for under $200. And I saw the red baby above, described as vintage, available for $2,000 or so. Yikes. 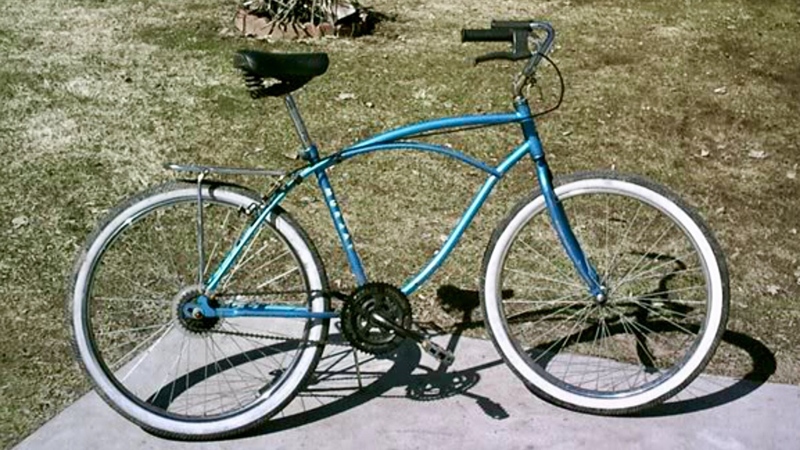 After my Stingray days, I moved a half-foot up to the 26-inch Murray touring bike. Like this one, but beige. This beige baby is the bicycle that took me so many miles around Stony Brook, Setauket and Old Field with my friends. I rode it to the shores of the Long Island Sound. I rode it to the Smith Haven Mall. I rode it to Ward Melville High School. I loved the touring style handlebars instead of the English Racer type that most of my friends had selected. I rode up high while they bent down low. Bike riding. Yeah. I liked it a lot. I’ll never forget how much. What’s your relationship with bicycles? Will you ride a bike to work on May 19, and if so, what will that trip be like for you? You can do it, runner Cynthia. Good for you, getting back up on the bike, Diana. Me … I have to really thing about it. haha ahh I’m no Lance Armstrong, I just go for short and relaxing rides in my neighborhood – it’s wonderful! Many bikes at our home, I prefer walking on the beach but have been known to join the gang riding bikes on the hard packed sand! Fun. Beach riding sounds like fun, Gatorette. That would be getting back in for the long haul, Beth. Yikes! Love the memories you have! It’s like the bikes were your friends 🙂 I didn’t do much as a kid, but enjoy riding now even if just to get from points A to B. Though need a better tire right now so the bike is benched. With the snow gone and the temps up it’s time to take care of that and ride! Hope you get out and about eventually as well. My balance is a tad off, I fear, Patricia. You are a better person than me if you sticking with the cycling, Louse.